The 13 GHz SDA 13000 is ideal for analysis in systems with serial data rates up to 7 Gb/s, while the 11 GHz SDA 11000 and 9 GHz SDA 9000 support rates up to 6.25 Gb/s and 5 Gb/s respectively. The three instruments feature an architecture supporting 2 channels at full BW. 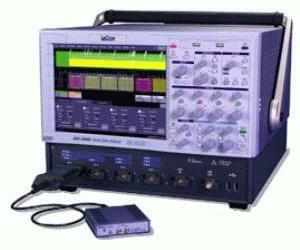 Each instrument shares the same advanced serial data and jitter analysis capabilities of the SDA 18000, including Q-Scale analysis. Lower bandwidth applications from 6 GHz to 4 GHz are also well served by a number of models in each bandwidth.